The new Eleaf iSitck Mix is a little bit different than the various iStick models you may remember. They introduce the product as “Art, Mix Tech”. It’s certainly a big change from the iStick’s of yester-vape, that’s for sure. I remember my very first iStick 30W, which was called Red, but was in fact a hot pink color, with a metallic satin finish. It was one of my first Eleaf products that I had purchased in 2015. It’s really neat to watch some of these devices evolve over the years, especially to watch certain devices from manufacturers you have relied on for a good bulk of your products. 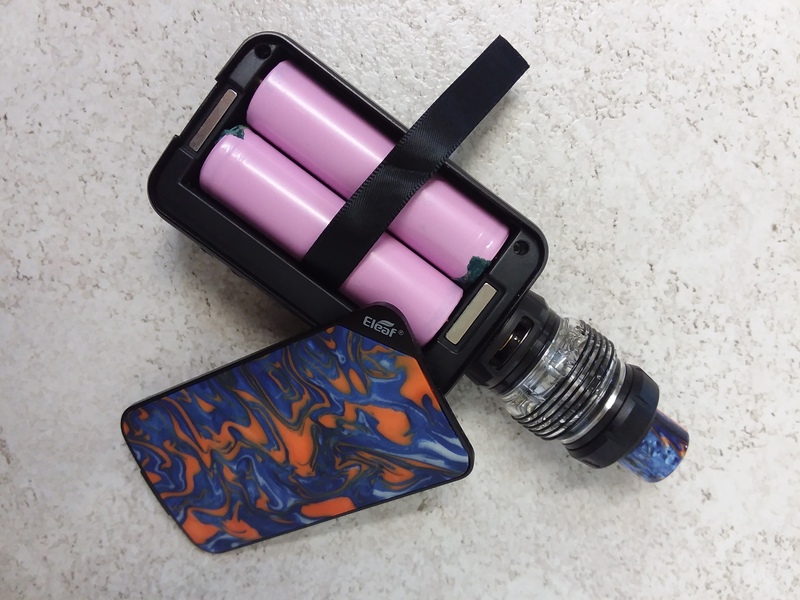 Eleaf hasn’t yet done a mixed double-sided design like the iStick Mix uses, and in fact has a few features that are noteworthy. 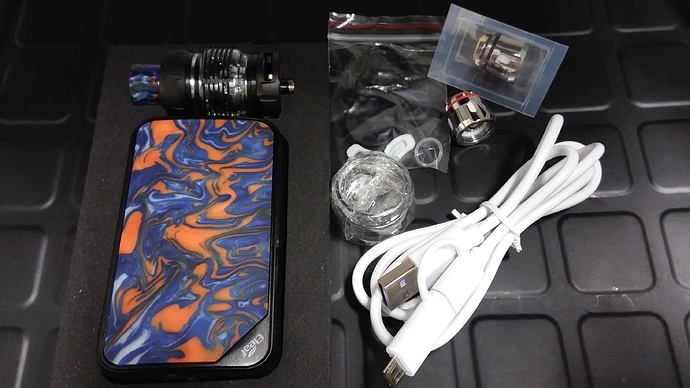 This kit was provided to me by Eleaf for the purpose of this review. 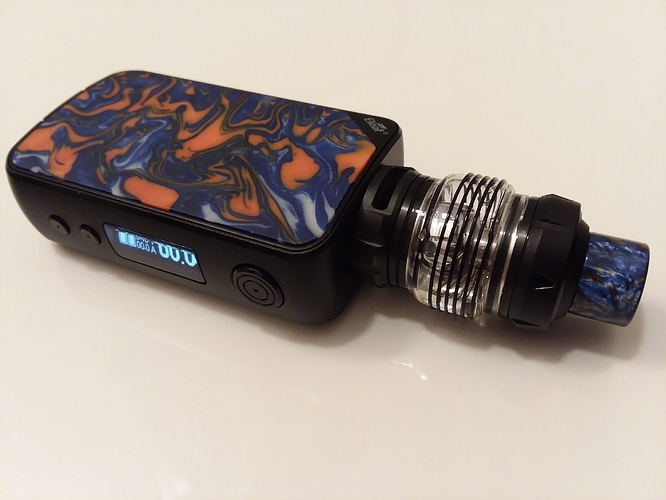 Obviously, the design was well thought out, and much different than some of the previous iStick devices, which really stuck to similar color schemes all the way up to the iStick TC 100W. With the arrivals of the iStick Pico and Power saw some changes to the color and paint styles used. The Mix uses a double-sided design of IML and Resin. The IML stands for In Molding Label, which protects the design from minor bumps or scratches, and it simply isn’t a sticker that can be peeled up either. The IML design is protected between layers, so it keeps its gorgeous luster (even after bazillions of fingerprints). While the IML side is smooth and glossy, the Resin side is a little more matte in texture, and velvety like we would expect it to be. I enjoy this kind of duality in appearance, it really gives the mod some needed ooomph. 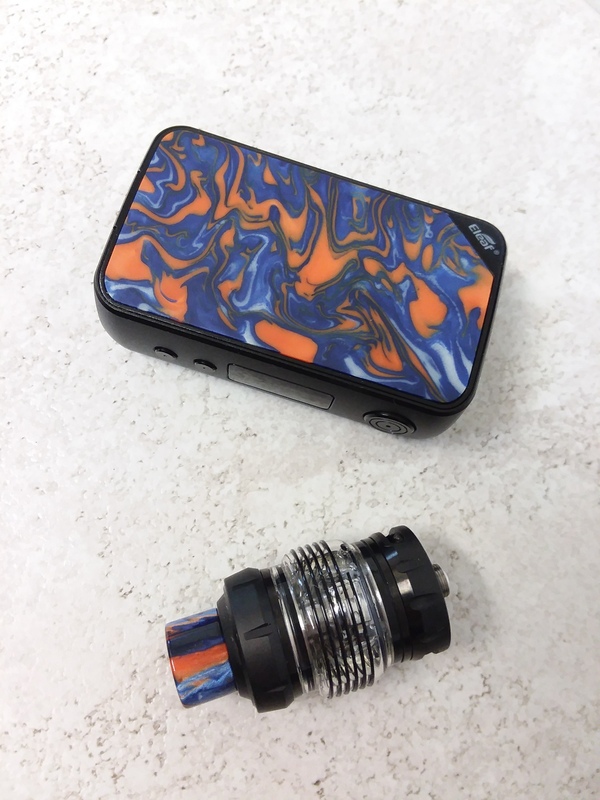 The 510 connector on the device is pretty low key, and the pin is rounder in shape than on previous iStick versions. The plating itself is slightly raised with two Torx screws, but not enough so that your atomizer won’t sit mostly flush with the device. 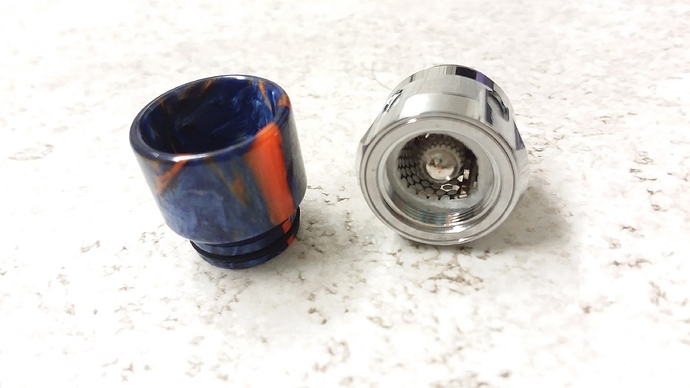 The sides of the mods actually curve outward, eliminating the boxy appearance of similar mods. Ergonomically, it fits quite well in hand, and doesn’t feel odd while holding. I know my issue with some similarly styled mods were the sharp corners, I mean sharp. You know what I mean. The Resin sided panel can be removed to change or put in batteries, and something that really impressed me is just how well the panel sits and doesn’t protrude. It is easily accessible with a slight dip and opening that sits underneath the mod, so that the actual lip to get your finger under isn’t seen from the sides. The firing button as well as the +/- are really minimal in appearance. Simply a dot in the middle for +/- while the firing button has two circular etchings and a middle dot. Thank goodness, because I really don’t like those blinding metallic transformer looking firing buttons. The device itself is pretty compact, and is a bit smaller than what I would expect from a dual 18650 device. The biggest change in appearance for me would have to be the quality of design for the iStick Mix. It definitely doesn’t seem like a cheaper mod in appearance. The new Ello Pop is slightly different in design from the Ello Duro, but not by much, just some slight differences. The most notable being the airflow, as well the protective silicone rings that encompass the middle of the glass tube. The new protective rings have stopped the glass during a few impact tests, but I wouldn’t want to test that out on concrete. For being protective, they are quite thin, but they would need to be for viewing the e-liquid level in your tank. I found that it was a little harder to view when I was using a clear blend, and found myself tipping the tank just to get a better view of my level. The airflow on the Ello Pop has two inlets, and because it has less compared to the Ello Duro, the airflow is somewhat restrictive. I honestly prefer the airflow of the Ello Duro, but only due to my style of vaping. I do tend to like a more wide open and flowy airy vape. 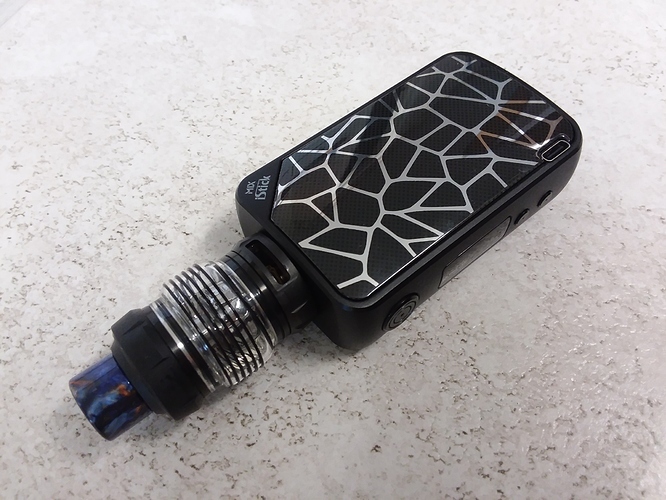 The good thing about the restrictive airflow is the use of the new HW-M2 and HW-N2 coils, which are a netting style mesh and multi-hole style mesh. The flavor from the new coils is intense, and the Ello Duro also uses these coils. 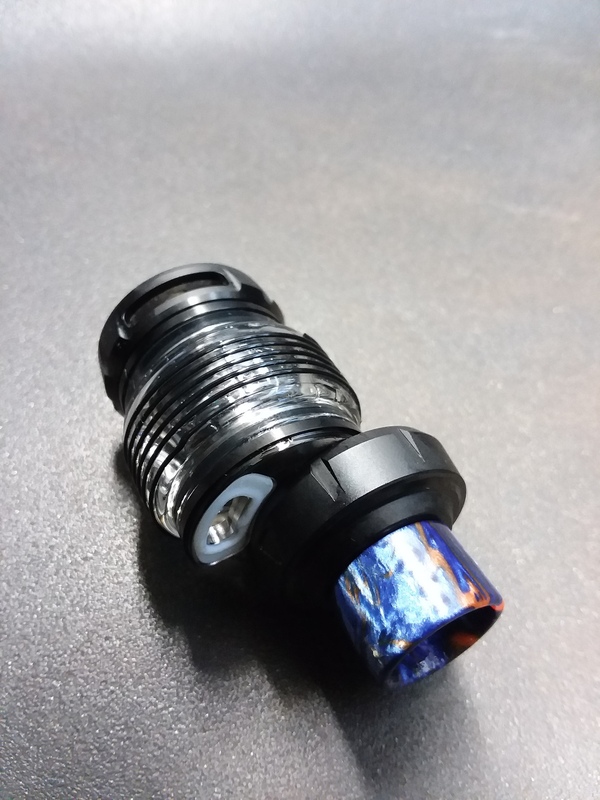 Due to the cylindrical airflow structure inside the coil, the e-liquid sits lower than the airflow to prevent leaking, and also gives a 360 degree pull on the coils themselves, instead of simply a small side. The Ello Pop also has a differently designed Child-proof top fill. To fill, the top must be lifted and then slid toward the arrow to open. It has been a little more of a pain to fill, but the design is sound. It’s not simply that it is hard to open, but you may forget how due to the only arrow being for the slide action. Now, I already know full well that I enjoy the new HW-M2 and HW-N2 coils having tested them on the Ello Duro, they are pretty fantastic. 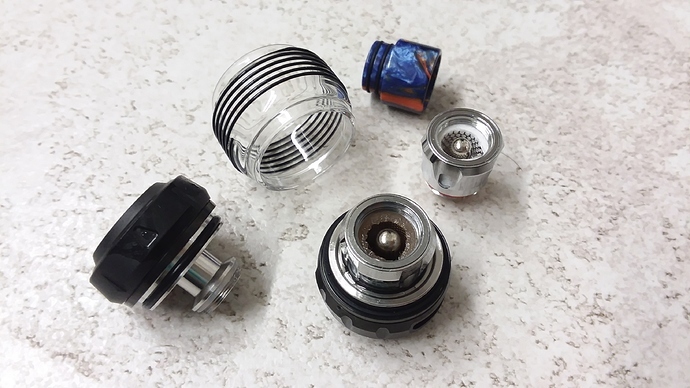 The new porous cotton and Leak Proof cylindrical airflow are serious bonuses to the coil and flavor. The Ello Pop was just slightly more restrictive than I personally like, but the flavor however was still right on par with what I experienced with the Duro. Using the iStick Mix was comfortable as it has an ergonomic shape, and velvety feel. Using the mod in TC mode was actually a pretty balanced and enjoyable vape using my SS Triple Core Claptons. I tend to like a lower degree when using TC, but I mostly prefer to keep to VW. That is where I experienced a little bit of a hiccup. 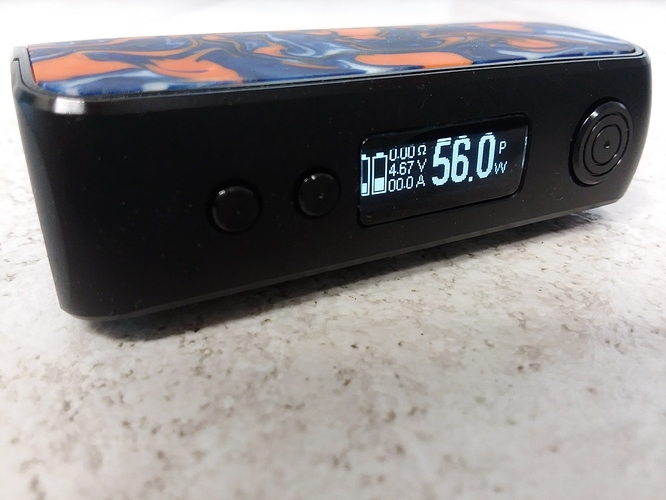 Now, in using the device with my RDA and SS coils in VW mode, I noticed that with each change in resistance as I vaped, my wattage was constantly being bumped down to 30W. That was solely with a resistance increase. As the RDA and coils cooled, the resistance would go back down, but would not change the wattage. The Firmware for the device was version 1.01 out of the box, and I have since upgraded to the version 1.02 and have yet to have the issue occur using the newest firmware version, but I have to point out that this was happening several times a day, sometimes twice per vape session. I do understand that some devices will give you a recommended wattage level as an atomizer is attached and the resistance is read, but this was during usage after my settings had already been established. I know that the resistance changes were correct, I even know how much my resistance will likely increase during a vape, which is perfectly normal for my coil type in VW mode. The iStick Mix and Ello Pop are strong contenders in a line of great products, and I still find myself wanting to buy another iStick TC 100W after my husband sort of killed it. It was a fantastic parallel mod, and offered great battery life. The iStick Mix will definitely be a daily driver in my rotation. While I will always push to charge batteries externally, the Quick Charge Type C USB is a modern touch for a new era of iStick. Note: If you do update the firmware via the support page from 1.01 to 1.02, you may get a failed message for the Windows Version on the first try. Unplug the device from the PC, wait a few seconds and open the application again, and press upgrade to pick the 1.02 version BIN file. Thanks for the review, Silly! Really enjoy your reviews. Great detail where it’s needed and good choices of where to give a brief description. Excellent review!!! Great job @Silhouette. I still have surviving and daily duty iStick 30w, and have a soft spot in my heart for them. Thanks all! Man, would I love to see an updated version of the TC 100W, I loved that darn thing. The side firing could be a little crunchy, and the actual button was tiny but it was superb on battery life. @SessionDrummer my 30W is still going strong too, I remember I used to the rock the little Subtank Mini on there. Good times (not very flavorful times/bad wicking times/those awful coil times).